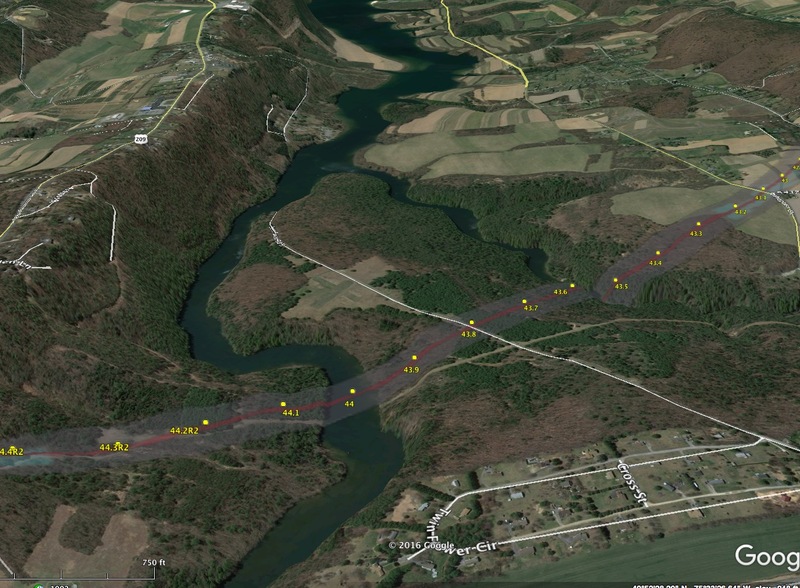 This is part 17 of the 3D flyover video series of the PennEast routes. In this installment, we look at the route in the area of Beltzville Lake between mileposts 49 and 40. Starting at 0:30 in the video and for a large portion of this part of the route, we see extensive traversals of the pipeline up and down steep slopes. Most of it not co-located at all. So we have a very unfortunate roller coaster ride through some of the prettiest wooded and agricultural land in PA.
And the HDD plan vertical profile view (that shows how deep it goes). The HDD looks great, so long as it works. As with the other sites in the area, if it does not work, PennEast will simply ask for a variance from PADEP to open-trench this area as well. Given the dearth of survey data it generally has available, nobody knows if the HDD is actually a viable option here or not.